We spent a day this week cleaning out a pond that had been going through a few tough years. The plants had grown in over time and had infiltrated the water column, the algae had taken over, and not even the frogs wanted to hang out there anymore let alone the people. Don't let this happen to you! There were a few other things on this pond that needed some TLC but the two problems mentioned above were interconnected more than the proud pond parents knew. 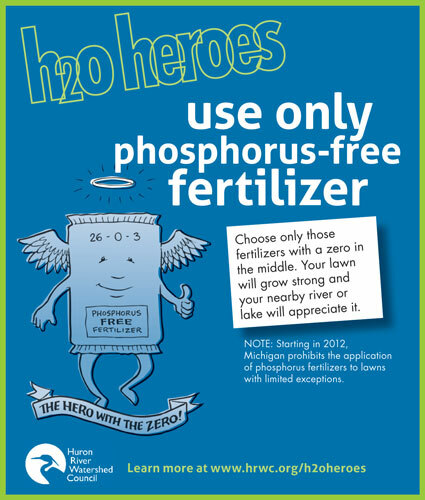 You see, Phosphorous is the #1 Algae grower in any pond, watershed and even lake. You might be asking yourself now "How would Phosphorous even make it into any water?" The answer is probably in your garage right now. The culprit is most often lawn and garden fertilizer. For decades fertilizer companies have been selling lawn and garden food with Phosphorous in it even though a lawn or garden doesn't need it. The last few years we have seen many company's creating phosphorous free fertilizers and pond owners, lake front home owners and nature lovers alike should be lining up to purchase this alternative. The pond I mentioned earlier in this post had an algae problem caused by too much phosphorous. The area around the pond was often granularly fertilized and then irrigated daily. The run off from the granular fertilizer would seep into the pond following the plants it had been sprinkled on and creating a perfect algal storm. To solve this problem (or at least begin to create a healthy ecosystem) we did a thorough clean and pump out, a removal of the plants that had infiltrated the pond, and a recommendation that they stop using that type of fertilizer or at least began to apply it no closer than 10' to the edge of the water. Some states have gone so far as to outlaw the sale of phosphorous fertilizers all together to stop the phosphorous seepage into waterways. It should also be mentioned that another way Phosphorous sneaks into your yard is through amended mulch. This too should be avoided. (Lake front home owners in Northern Michigan should contact The Lake Charlevoix Association ) In Michigan, Phosphorous is no longer in lawn fertilizer (or shouldn't be) but it is still present in garden and flower food. So keep your eye out for the middle number on a bag of granules. The middle number needs to be 0. The bags always have three numbers separated by a dash. Make sure what you buy has a 0 in the middle! Zero Phosphorous equals fewer algal blooms in watersheds and garden ponds.